Rosalie Coschignano/Contributing Photographer Dylan Davis, a first-year graduate student studying anthropology, presents his research at the third annual GIS Day, hosted by the geography department, on Friday. Binghamton University President Harvey Stenger opened the third annual Geography Information System (GIS) Day on Friday as he declared his intent to use GIS technology on campus and in the town of Vestal. The event, hosted by the geography department and the GIS and Remote Sensing Core Facility at BU, provided a forum for faculty and students familiar with GIS to demonstrate its potential applications. GIS, a technological system that uses geographic information to collect and interpret data, can be utilized across a wide range of fields including archaeology, anthropology and communications. Various presenters who attended the event showcased research across each of these fields involving GIS. Stenger said he hopes to utilize GIS story mapping, an interactive data-organizing mechanism that creates overviews on specific areas of research and makes gathering information easier, to track the development of urban growth throughout his revitalization project in Vestal, where he aims to create more jobs. Lucius Willis, adjunct lecturer of geography at BU; Kevin Heard, adjunct lecturer of geography and associate director of the GIS Core Facility; and University Provost Donald Nieman were also in attendance. The day featured a poster competition between graduate and undergraduate students who created presentations of research in varying academic fields incorporating GIS. Attendees had the chance to vote for their favorite poster before the event began. One presenter was Dylan Davis, a first-year graduate student studying anthropology, who presented his research on irregular fractures within soil in South Carolina. He used GIS to compute an algorithm that would pinpoint topographic anomalies, such as mounds and rings, where human activity was distributed across the area. Many of these fractures turned out to be previously overlooked artifacts. The overall winner of the committee’s choice and the attendee’s choice awards was Dylan Stackpole, a junior majoring in geology, whose research involved the link between lack of transportation and obesity in the city of Binghamton. Stackpole plotted the main food outlets in the city of Binghamton, including supermarkets and grocery stores, and used the city’s transit system to determine which of these were most accessible by consumers. He found that it was much easier to access less healthy food options within the city, which contributes to obesity and malnutrition. Faculty members within the geography department also presented their own research. 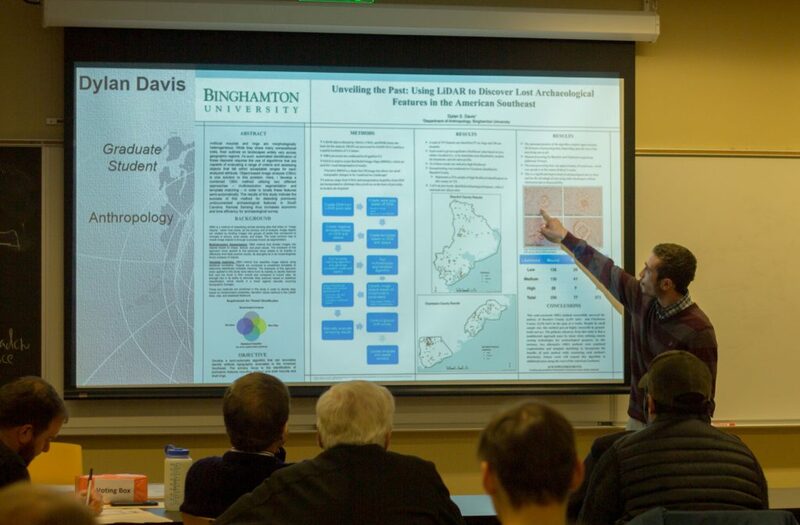 Brendan Lavy, visiting assistant professor of geography, discussed using GIS to track where trees were most commonly excavated in Austin, Texas. Chengbin Deng, assistant professor of geography, also presented his research on geotagging BU students’ tweets from the 2015 school year using geospatial data, demonstrating how geographers can take advantage of social media using GIS. Willis, who organized the event, highlighted the importance of GIS in everyday life.